Laurie Lufkin Wins Most Delicious Dish Florida Tomato Recipe Contest! 5/18/2011 – MAITLAND, FL – Laurie Lufkin of Essex, Massachusetts, wins the first “Most Delicious Dish” Florida tomato recipe contest with her “Red Florida Tomato Basil Pie with Savory Parmesan Crust.” The winning entry was selected by Florida Chef Justin Timineri, executive chef and culinary ambassador of the Florida Department of Agriculture and Consumer Services and Samantha Winters, director of education and promotion for the Florida Tomato Committee, which sponsors the contest. The Most Delicious Dish recipe contest celebrates the versatility and great flavor of Florida tomatoes. Recipe entries are being accepted through June, for the spring contest, with new submissions being accepted in September in line with the next Florida tomato season. Winners are awarded a cash prize and a Florida tomato apron. Florida is the nation’s largest producer of fresh tomatoes. With almost every southern county in the state cultivating tomatoes, Florida produces virtually all the fresh-market, field-grown tomatoes in the U.S. from October through June each year, and accounts for about 50 percent of all fresh tomatoes produced domestically. In the bowl of a food processor (or by hand, or with a fork, or a pastry blender) combine flour and butter until butter is incorporated and the size of small peas. Blend in cheese. Add water, a tablespoon at a time, pulsing if you are using the processor. Mix until dough forms a loose ball. Divide in half, form into a disc and wrap tightly in plastic wrap. Refrigerate for at least one hour or until ready to use. This step can be done days in advance! Preheat oven to 300 degrees. Toss cut tomatoes with olive oil, herbs and salt and pepper to taste. Bake in preheated oven for 1 hour until wrinkled, lightly browned and caramelized. Set aside to cool (this step can be done well in advance as well). When ready to bake, increase oven temperature to 375°. Move oven rack to the second to bottom setting and place a stoneware baking stone on the rack (if available). Slice fresh Florida tomatoes into ¼ inch slices and lay flat on a kitchen towel to remove some of the moisture. Lay another towel on top and press down lightly. Set aside. Roll out one crust and fit into pie plate. 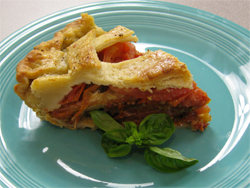 Sprinkle tapioca on to the bottom of the crust and top with julienne sun dried tomatoes. Sprinkle on half of the roasted tomatoes. Place a layer of fresh tomatoes over sun dried and spread on pesto. Top pesto with cheese, remaining roasted tomatoes, followed by another layer of sliced tomatoes. Roll out remaining crust and cut into strips. Make a lattice (woven) crust for the top or a traditional flat top crust with lots of vent holes to allow the steam to escape. Brush top crust with beaten egg and sprinkle on freshly ground black pepper. Bake in preheated oven for 45 minutes uncovered. Cover top lightly with aluminum foil if over browning and cook for 5-10 more minutes until bottom crust is browned. Allow to cool on a baking rack for 10 minutes before serving. Can be served hot or cold.